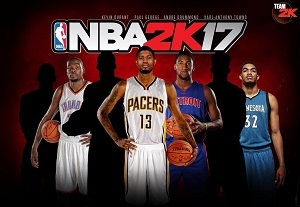 In this guide, we will give you an overview of all PS / Xbox controls and commands for a successful entry into the latest basketball simulation game NBA 2K17. Hands up defensive - Move Right Stick upwards and left stick towards the enemy. Shot contest - Move Rights Stick toward the pitcher. Vertical contest - Move Left Stick from away opponents and then Triangle / Y.
Bump (ram opponents easily) - L2 / LT hold in the way of the attacker. Post Up / ball denial (opponents in the post) - Hold L2 / LT and left stick towards the enemy. Spin gather - R2 and tap twice square / RT and tap X. Hop gather - Square / X and the direction determined with the left stick. Reverse Lay Up - During the Drives hold the right stick toward baseline. Runner - Hold right stick from the basket while the drives. Euro Step - Square / X twice tapping during Drives. Flashy Dunk - Press R2 / RT hold and move away from the basket (hoop). Dominant / Off-Hand Dunk - Hold R2 / RT and the left stick in the direction of the off-hand. Step through - Pump Fake and then press the right stick before the Pump Fake ends. Putback Dunk / Lay Up - Move and hold the right stick in the direction of offensive rebounds. Lead to basket - Triangle / Y hold and release when the ball is to be played. Flashy pass - Tap twice Circle / B quickly. Dribble Pitch / handoff - Circle / B hold and release when the ball is to be played. Fake pass - Press Triangle / Y and then circle / B. Give and Go - X / A hold and release, when the ball is coming back. Rolling inbound - Triangle / Y during baseline inbounds. Pro Stick Pass - move R1 / RB and the right stick. In and Out - R2 / RT and move the right stick toward the basket move. Hesitation (fast) - Moves the right stick in the direction of the ball leading hand and then let go. Hesitation (escape) - Press R2 / RT and the right stick in the direction of the ball leading hand and then let go. Rhythm Dribbling - Move the right stick in the direction of the basket / hoop and then let go quickly. Crossover - Move the right stick toward your free hand and then let go. Crossover (escape) - Press R2 / RT and the right stick in the direction of the free hand and release. Step Back - Press R2 / RT and move the right stick from the basket away. Spin - Rotate the right stick in a full circle and makes sure which hand the ball is straight. Half spin - Rotate the right stick a quarter-circle of the ball hand to the basket and then back. Triple Threat Step Back - Press R2 / RT and move the right stick from the basket away. Triple Threat Spinout - Turn right stick and then set it back. Triple Threat Jab - Move the right stick to left or right and let it go. Triple Threat Combo - Move the right stick toward the basket and let it go quickly.